The book began for me with a visit to the source of the River Sals at Sougraigne near Rennes-les-Bains. It was such a wonderful day, my thoughts kept returning to my mental image of the water that never fails, simply bubbling out of the ground, always there, flowing eternally down from the mountains to pass through Rennes-les-Bains. 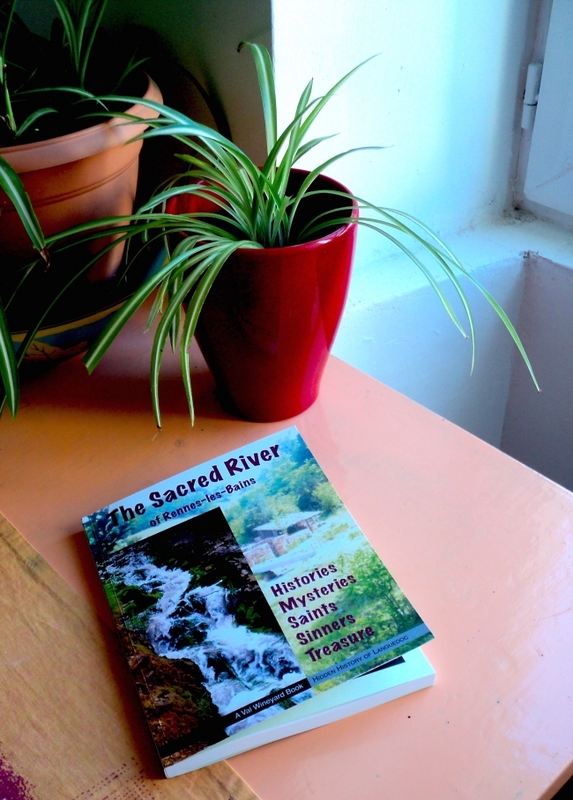 I decided to feature the river Sals in a simple history of Rennes-les-Bains. Did I say simple! One connection led to another, the tiniest piece of research opened several doors, things started coming to me, people told me things, dreams woke me and made me write down new ideas, new avenues of explorations, it was rich and never ending. (Just two days before printing, new information arrived out of the blue.) I couldn't write fast enough! The personalities who lived at Rennes-les-Bains were so strong that I felt that I knew them. I found new facts about local characters; did you know three people believed to have been Gods have lived at Rennes-les-Bains? Did you know about the secret castle up the hill? Have you ever made love to your lover at the Fontaine des Amours? Then, there is also the mystic Celts and the Romans, the Visigoths and their Treasure of Jerusalem, the secrets of Bugarach and the end of the world, Pierre Plantard, how to find gold for yourself, and Mary Magdalene at Rennes-les-Bains. The town is connected with her, and Lazarus and many believe Jesus was buried nearby. Thanks Robert. This is discussed in the book! There's another sacred river. It’s near Tripoli in the Arcadia region of southern Greece. Modern writers call it Altheus, and the Greeks call it Alpheios. It disappears underground. Alph the sacred river refers to the underground stream of knowledge so beloved by the King René d’Anjou of the fifteenth century and the freemasons of today. It is pleasant surprise to discover this hidden stream - hidden from history and maybe from our own consciousness? Once we know about it, it seems that we’ve always known. The River Sals at Rennes-les-Bains is also symbolic of hidden knowledge. Pierre Plantard, who played such a strong role in the Rennes-les-Château mysteries, knew about the Arcadia region of Greece, claiming the children of Jesus lived there and founded a bloodline that became the Merovingians, the rightful kings of France. This story was followed by the writers of The Holy Blood and the Holy Grail. The French King, René d’Anjou was also known as Good King René because of the many charities he supported. He was not the King of France but the King of Naples; his other titles included the Duke of Anjou and the Count of Provence. He was a leading character in fifteenth century France. He was involved in esoteric things which included the search for the Holy Grail, which many now think represents the bloodline of Jesus Christ through Mary Magdalene; an underground stream of knowledge indeed. René wrote an allegorical tale, finished in 1457, called Le Cuer d’armours espris - The Heart pierced by love - which was illustrated with beautiful paintings. René commissioned the illustrations and supervised the work. They were done by Barthélémy d’Eyck, his court painter. The two men were close, for Barthélémy was his varlet de chambre for many years. 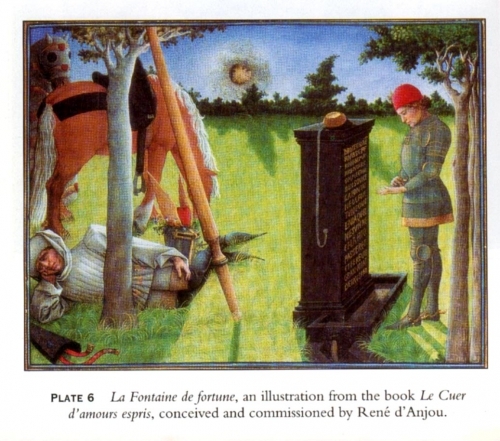 One of these paintings is called La Fontaine de Fortune. It was dedicated to René’s Cousin et nephew Jehan Duc de Bourbon et d’Auvergne. This Jehan wrote poetry under the name Jehan L’Ascuiz. He was quoted in the alternative history books written or co-authored by Michael Baignent and Richard Leigh, because Jehan’s poetry was so liked by Richard Leigh. The word Ascuiz was a common noun of the Pyrenees, the nearest translation being a lyric verse in Greek or Latin. Could Ascuiz be a pen-name of Jehan the Duc writing about the Pyrenees? Yes indeed. The real Jehan was Jean II de Bourbon, who lived from 1426 to 1488 and in 1456 became the Duke of Bourbon and Auvergne. He was the son of Charles I and Agnes of Burgundy and in 1447 he married Jeanne of France, who was the daughter of King Charles VII and his wife Marie d’Anjou - René d’Anjou’s sister. In the writings of the time, Jean was known as Jehan. His brilliant court was at Moulins and included several poets and writers such as Philippe de Commynes and Henri Baude. A poet himself, some of his work is among the manuscripts of Charles of Orleans. A lover of music, Jehan also played the lute. He was René d’Anjou’s cousin and nephew. The dedication of René’s book to him implies they were both interested in the Holy Grail and the underground stream of knowledge. René d’Anjou himself was born in January 1409 and died in July, 1480. He was first married in 1420 (at the age of twelve!) He and his wife Isabelle had 10 children, 4 before he was 20. He also had 3 illegitimate children, the last of whom was called Madeleine, which is the French version of Magdalene. His court was made up of the aristocracy and minor aristocracy of the time; his doctors included the father of Leonardo da Vinci and the two grandfathers of Nostradamus, who himself became a doctor, as well as writing his secret predictions. His first wife died in 1453 and his second marriage was to Jeanne de Laval who seemed to be more in tune with him, he could spend time on his manuscripts and troubadour stories, the first being The Heart Stricken by Love. At this time in the troubadour world, the word love had a different meaning, it meant brother love, divine love, compassion, religious love. This reflects the Holy Grail. Use the little arrow choose your price option, click it (countries outside Europe are included in the States) and then "Buy Now." If you prefer to use Amazon for book-buying, you can find my book there. Click here. If you already live in France as I do, you must use Amazon.fr. Click here.